The peso (established as the peso convertible) is the currency of Argentina, identified by the symbol $ preceding the amount in the same way as many countries using dollar currencies. It is subdivided into 100 centavos. Its ISO 4217 code is ARS. Since the late 20th century, the Argentine peso has experienced a substantial rate of devaluation, reaching 25% year-on-year inflation rate in 2017. The official exchange rate for the United States dollar hovered around 3:1 from 2002 to 2008, climbing to 6:1 between 2009 and 2013. By August 2018, the rate had risen to 40:1. Amounts in earlier pesos were sometimes preceded by a "$" sign and sometimes, particularly in formal use, by symbols identifying that it was a specific currency, for example $m/n100 or m$n100 for pesos moneda nacional. The peso introduced in 1992 is just called peso (until 2002 peso convertible), and is written preceded by a "$" sign only. Earlier pesos replaced currencies also called peso, and sometimes two varieties of peso coexisted, making it necessary to have a distinguishing term to use, at least in the transitional period; the 1992 peso replaced a currency with a different name, austral. The peso was a name often used for the silver Spanish eight-real coin. Following independence, Argentina began issuing its own coins, denominated in reales, soles and escudos, including silver eight-real (or sol) coins still known as pesos. These coins, together with those from neighbouring countries, circulated until 1881. In 1826, two paper money issues began, denominated in pesos. One, the peso fuerte ($F) was a convertible currency, with 17 pesos fuertes equal to one Spanish ounce (27.0643 g) of 0.916 fine gold. It was replaced by the peso moneda nacional at par in 1881. The non-convertible peso moneda corriente (everyday currency) ($m/c) was also introduced in 1826. It started at par with the peso fuerte, but depreciated with time. Although the Argentine Confederation issued 1-, 2- and 4-centavo coins in 1854, with 100 centavos equal to 1 peso = 8 reales, Argentina did not decimalize until 1881. The peso moneda nacional (m$n or $m/n) replaced the earlier currencies at the rate of 1 peso moneda nacional = 8 reales = 1 peso fuerte = 25 peso moneda corriente. Initially, one peso moneda nacional coin was made of silver and known as patacón. However, the 1890 economic crisis ensured that no further silver coins were issued. At the beginning of the 20th century, the Argentine peso was one of the most traded currencies in the world. The Argentine gold coin from 1875 was the gold peso fuerte, one and two-thirds of a gram of gold of fineness 900, equivalent to one and a half grams of fine gold, defined by law 733 of 1875. This unit was based on that recommended by the European Congress of Economists in Paris in 1867 and adopted by Japan in 1873 (the Argentine 5 peso fuerte coin was equivalent to the Japanese 5 yen). The monetary system before 1881 has been described as "anarchistic" (anarquía monetaria). Law 1130 of 1881 put an end to this; it established the monetary unit as the peso oro sellado ("stamped gold peso"), a coin of 1.612 grams of gold of fineness 900 (90%), and the silver peso, 25 g of silver of fineness 900. Gold coins of 5 and 2.5 pesos were to be used, silver coins of one peso and 50, 20, 10 and 5 centavos, and copper coins of 2 and 1 centavos. The depreciated peso moneda corriente was replaced in 1881 by the paper peso moneda nacional (national currency, (m$n or $m/n)) at a rate of 25 to 1. This currency was used from 1881 until January 1, 1970 The design was changed in 1899 and again in 1942. Initially the peso m$n was convertible, with a value of one peso oro sellado. Convertibility was maintained off and on, with decreasing value in gold, until it was finally abandoned in 1929, when m$n 2.2727 was equivalent to one peso oro. The peso ley 18.188 (ISO 4217: ARL) (informally called the peso ley) replaced the previous currency at a rate of 1 peso ley to 100 pesos moneda nacional. The peso argentino ($a) (ISO 4217: ARP) replaced the previous currency at a rate of 1 peso argentino to 10,000 pesos ley (1 million pesos m$n). The currency was born just before the return of democracy, on June 1, 1983. However, it rapidly lost its purchasing power and was devalued several times, and was replaced by a new currency called the austral in June 1985. The austral ("₳") (ISO 4217: ARA) replaced the peso argentino at a rate of 1 austral to 1000 pesos (one billion pesos m$n). During the period of circulation of the austral, Argentina suffered from hyperinflation. The last months of President Raul Alfonsín's period in office in 1989 saw prices move up constantly (200% in July alone), with a consequent fall in the value of the currency. Emergency notes of 10,000, 50,000 and 500,000 australes were issued, and provincial administrations issued their own currency for the first time in decades. The value of the currency stabilized soon after President Carlos Menem was elected. The current peso (ISO 4217: ARS) replaced the austral at a rate of 1 peso = 10,000 australes (ten trillion pesos m$n). It was also referred to as peso convertible since the international exchange rate was fixed by the Central Bank at 1 peso to 1 U.S. dollar and for every peso convertible circulating, there was a US dollar in the Central Bank's foreign currency reserves. After the various changes of currency and dropping of zeroes, one peso convertible was equivalent to 10,000,000,000,000 (1013) pesos moneda nacional. However, after the financial crisis of 2001, the fixed exchange rate system was abandoned. Since January 2002, the exchange rate fluctuated, up to a peak of four pesos to one dollar (that is, a 75% devaluation). The resulting export boom produced a massive inflow of dollars into the Argentine economy, which helped lower their price. For a time the administration stated and maintained a strategy of keeping the exchange rate at between 2.90 and 3.10 pesos per US dollar, in order to maintain the competitiveness of exports and encourage import substitution by local industries. When necessary, the Central Bank issues pesos and buys dollars in the free market (sometimes large amounts, in the order of 10 to US$100 million per day) to keep the dollar price from dropping, and had amassed over US$27 billion in reserves before the US$9.81 billion payment to the International Monetary Fund in January 2006. The effect of this may be compared to the neighboring Brazilian real, which was roughly on a par with the Argentine peso until the beginning of 2003, when both currencies were about three per U.S. dollar. The real started gaining in value more than the peso due to Brazil's slower buildup of dollar reserves; by December 29, 2009 a real was worth almost 2.2 pesos. In December 2015, US dollar exchange restrictions were removed in Argentina following the election of President Macri. As a result, the difference between the official rate and the unofficial “blue” rate almost disappeared. The official exchange rate was on April 1, 2016, 14.4 to US$1. On November 10, 2017, it was 17.5. On November 2 2018, it was 36.60 after it hit the 42 pesos mark one month before. By March 27, 2019 it was 44.9. In 1992, 1-, 5-, 10-, 25- and 50-centavo coins were introduced, followed by 1 peso in 1994. Two peso coins for circulation were introduced in 2010. The 1-centavo coins were last minted in 2001. In 2017, there are plans to issue a new series of coins in denominations of $1, $2, $5 and $10. Commemorating the National Constitutional Convention, 2-peso and 5-peso nickel coins were issued in 1994. Some 2-peso coins were issued in 1999 to commemorate the centenary of the birth of world-famous writer and poet Jorge Luis Borges; they had an image of Borges' face on one side, and a labyrinth and the Hebrew letter aleph on the other. In addition, commemorating the 50th anniversary of the death of Eva Perón, on September 18, 2002 a new 2-peso coin with her face was created. It was said that this coin would replace the old AR$2 banknote if inflation continued to be high. None of the 2-peso coins are currently in wide circulation. Some other 50- and 1-peso coins exist commemorating different events, including the 50th anniversary of the creation of UNICEF (1996); the attainment of voting rights by women (1997); the establishment of Mercosur (1998); and the death of José de San Martín (2001). In 2010, commemorating the bicentennial anniversary of the May Revolution, several 1-peso coins were issued, all featuring the same obverse, different from the main series, and images of different places on the reverse, such as Mar del Plata, the Perito Moreno Glacier, mount Aconcagua, the Pucará de Tilcara, and El Palmar. In 1992, banknotes were introduced in denominations of 1, 2, 5, 10, 20, 50, and 100 pesos. 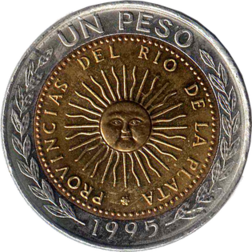 The 1-peso note was replaced by a coin in 1994. The pictures below are outdated, since they bear the legend "Convertibles de curso legal" (meaning that value was fixed to the same amount in US dollars). New bills, printed since 2002, do not have this text. As most bills have been replaced, it is rare to find ones marked as convertible except in the large $100 denominations. All bills are 155 × 65 mm in size. In 2016, the Banco Central de la República Argentina issued a new series of banknotes, with the 200 and 500 pesos banknotes as the newest denominations. A new 20 and 1000-pesos note were issued in 2017, and new banknotes of 50 and 100 pesos were issued in 2018. A new series of coins in denominations of $1, $2, $5, and $10 will be issued in 2018. ^ La Argentina, con la cuarta mayor inflación del mundo. ^ Billetesargentinos.com.ar Archived 2012-11-29 at the Wayback Machine (in Spanish), Billegesgarentinos.com.ar (in English) Billetes argentinos site. Spanish version is more detailed. ^ Banco Central de la República Argentina. "Notes". Banco Central de la República Argentina. Retrieved 25 June 2013. ^ "Argentina new note designs unveiled for 2017 introduction". ^ "El Banco Central anunció nuevos billetes con animales autóctonos". ^ " "El BCRA pone en circulación el nuevo billete de curso legal de $1000". Cunietti-Ferrando, Arnaldo J.: Monedas de la Republica Argentina desde 1813 a nuestros Dias. Cooke & Compañia. Editores Numismaticos, Buenos Aires, 1978. Cunietti-Ferrando, Arnaldo J.: Monedas y Medallas. Cuatro siglos de historia y Arte. Coins and Medals. Four centuries of history and art. Manrique Zago ediciones, Buenos Aires, 1989. Janson, Hector Carlos: La Moneda Circulante En El Territorio Argentino 1767-1998. Buenos Aires, 1998. Wikimedia Commons has media related to Money of Argentina. This page was last edited on 23 April 2019, at 05:36 (UTC).